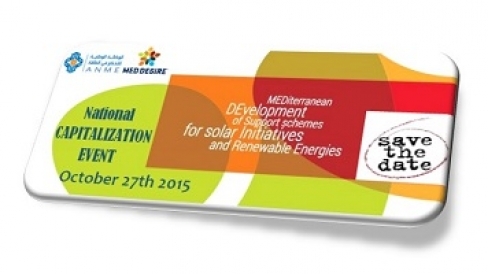 In the framework of MED-DESIRE project “MEDiterranean DEvelopment of Support Schemes for Solar Initiatives and Renewable Energies”, the National Agency for Energy Conservation ANME is organizing, in Tunis on October 27th, 2015, a National Capitalization Event on “Promotional Tools to stimulate solar distributed technologies market”. The National event is a part of the capitalization activities of the ENPI MED project MED-DESIRE, co-funded by the European Union through the European Neighborhood and Partnership Instrument - ENPI. The project main expected results are the implementation of an innovative financial and market stimulus instruments to support the widespread diffusion of solar energy technologies and the establishment of a co-operation framework among providers of energy technologies in Mediterranean Member Countries (MPC) to foster the development of a common energy market. - The second session will be concentrated on solar market stimulation instruments. Presentations will be made by key contributors from MED-DESIRE project partners as well as national relevant stakeholders. If you would like to participate in the event, an application form should be fulfilled directly through the link http://goo.gl/forms/BBYHiGXOuu.